Lovers glance into each others eyes and not down at their blackberries, the information age is 30 years away, neighbours chat in the streets and children play baseball in the backyards. Young men flirt and chat women up on the corners, conversations are live, over coffee instead of virtual. “Habaneros” live with no gadgets, no superfluous accessories, they make do with bare essentials. 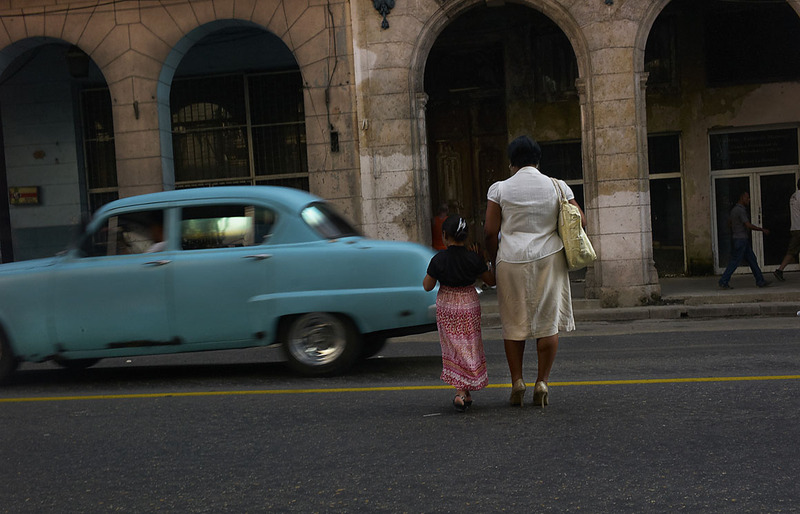 That is the Havana, Cuba, I experienced during a stay in November 2013, and the one I wish to share – a society caught in a developmental time wrap. True, the information highway has not arrived, the electronic gear box is still in Detroit, and you cannot download the latest episode of Desperate Housewives on iTunes. 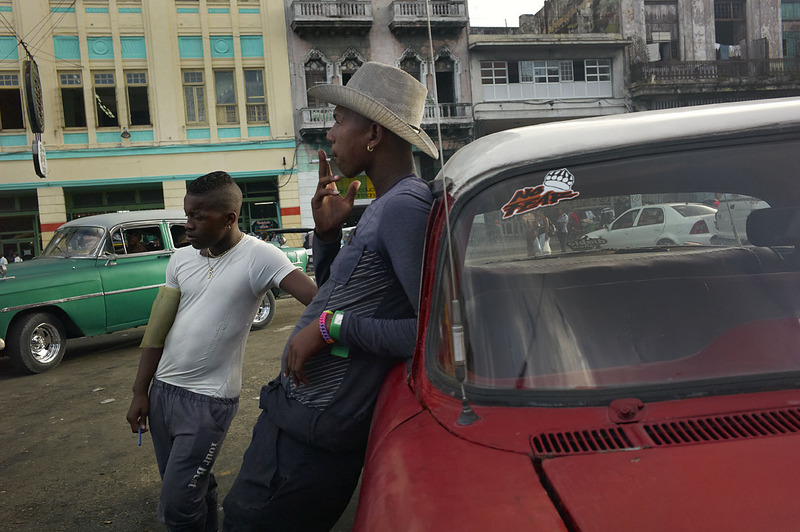 However, the fifties architecture, the period restored automobiles, the neighbourhood baseball game and the witty pick up lines are all still there, alive and well and living in Cuba. A bygone era no longer found in the rest of the world, washed away by the information tsunami. 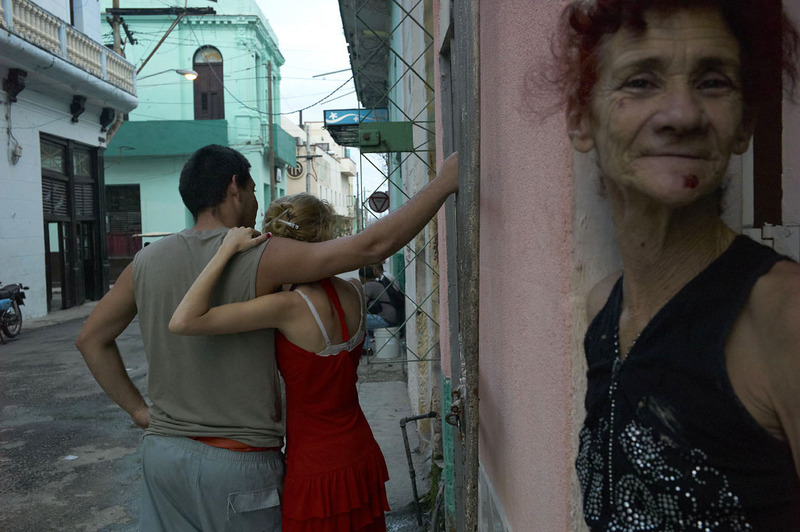 The photographs show, I hope, these halcyon days preserved on the streets of Havana. 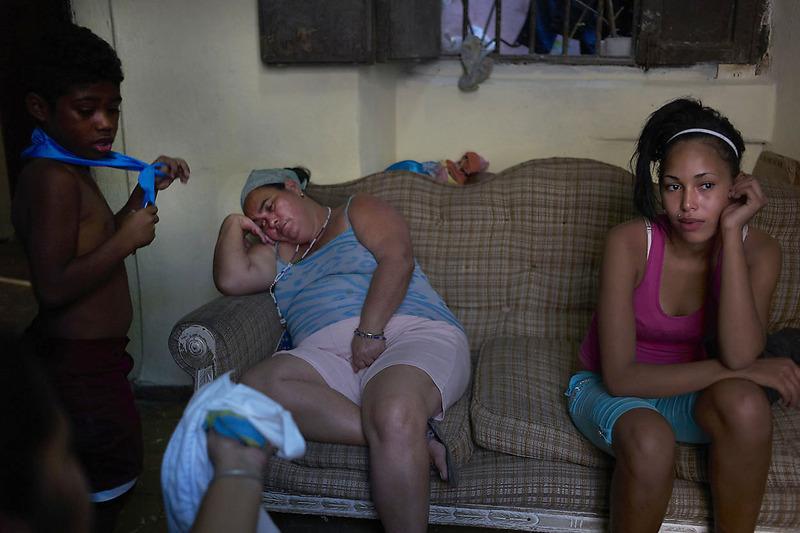 The photographs remind us of the true price of the SnapChats of our times, canned foods and instant noodles. 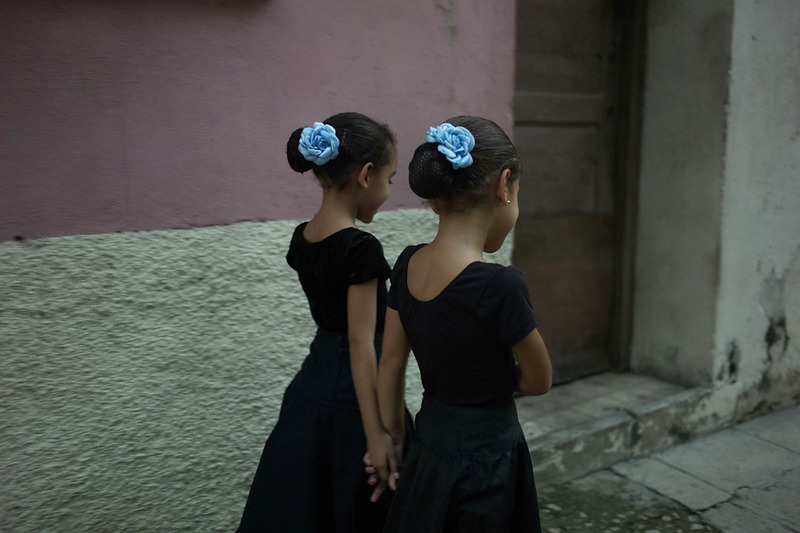 They show the charm of a gentler time that is about to, as the US trade embargo ends, catch up with modernity and disappear for ever. 1950s car. 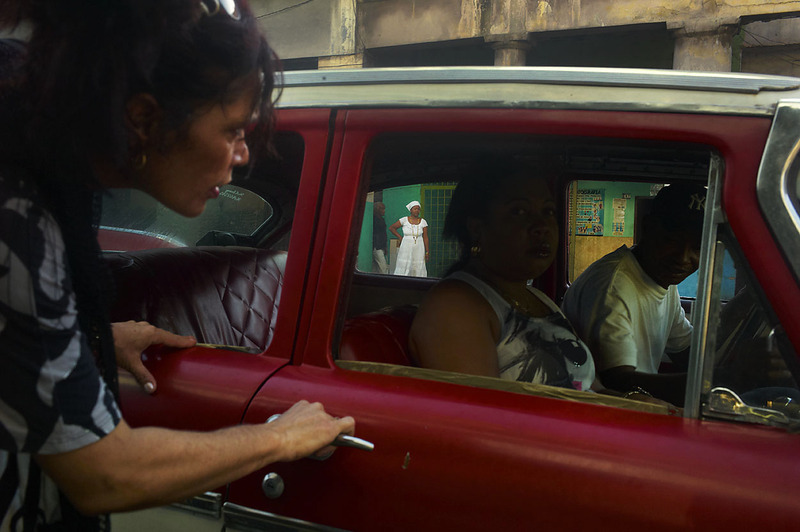 The old cars in Havana contribute to the charm of the city, making the city look like a movie set from the fifties. 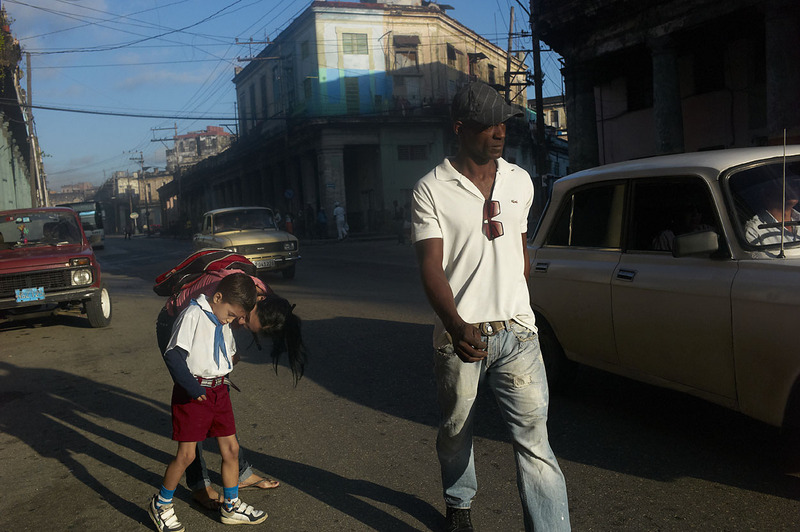 Habana Vieja, November 2013. 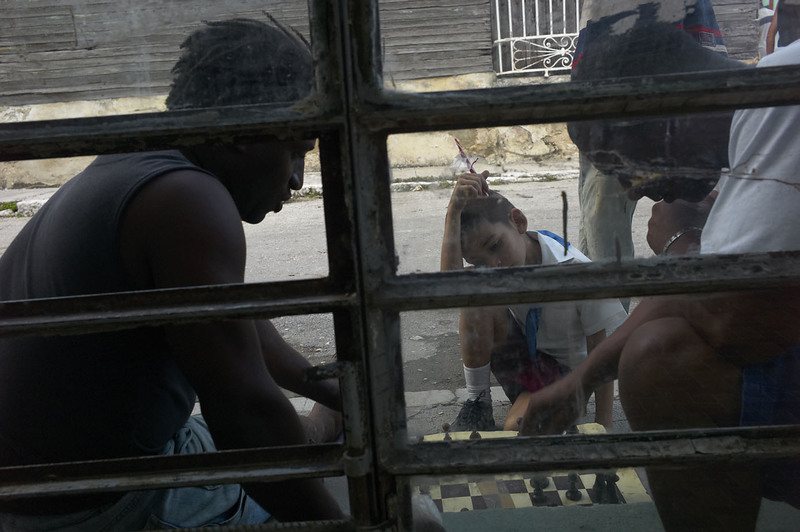 Kid watching adults play checkers on the street. Regla, November, 2013. 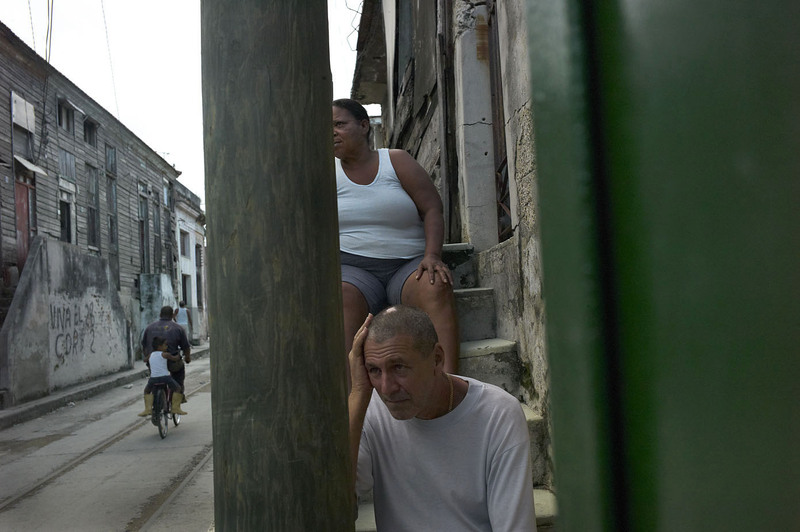 Street scene, Habana Vieja, November 2013. Kids playing inside their house. Regla, November, 2013. School recess. Children playing soccer. 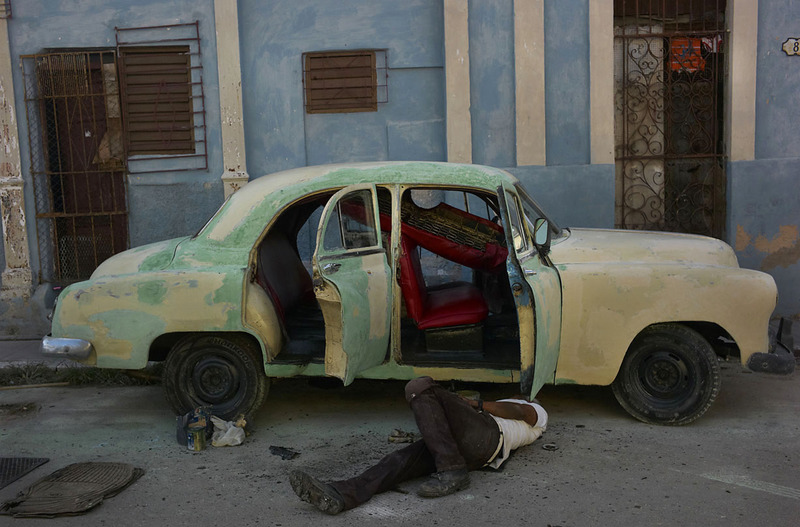 Centro Habana, November 2013. Woman outside her house watches people pass. Electrical cables are always run and connected outside the walls. Habana Vieja, November 2013. 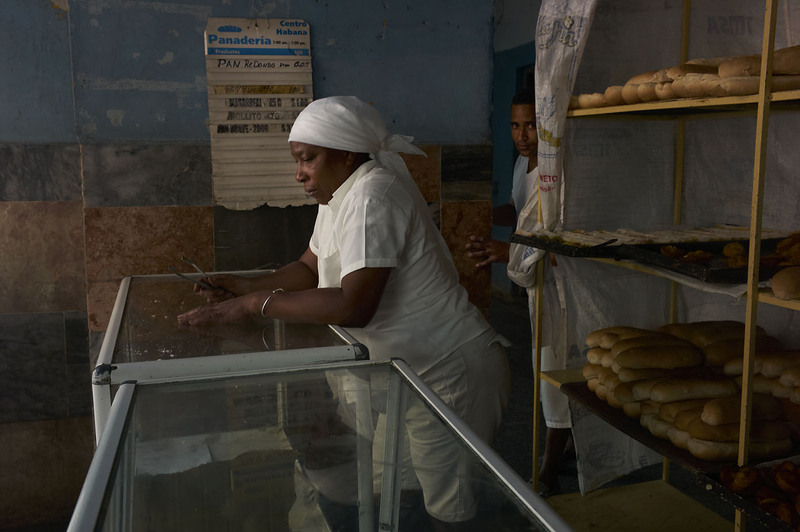 A typical Cuban bakery. There is only one kind of bread in 3 sizes. 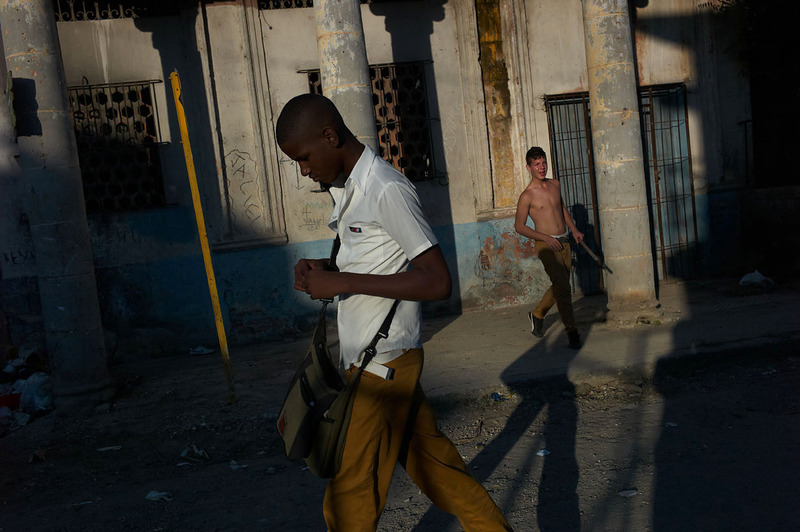 Centro Habana, November 2013. 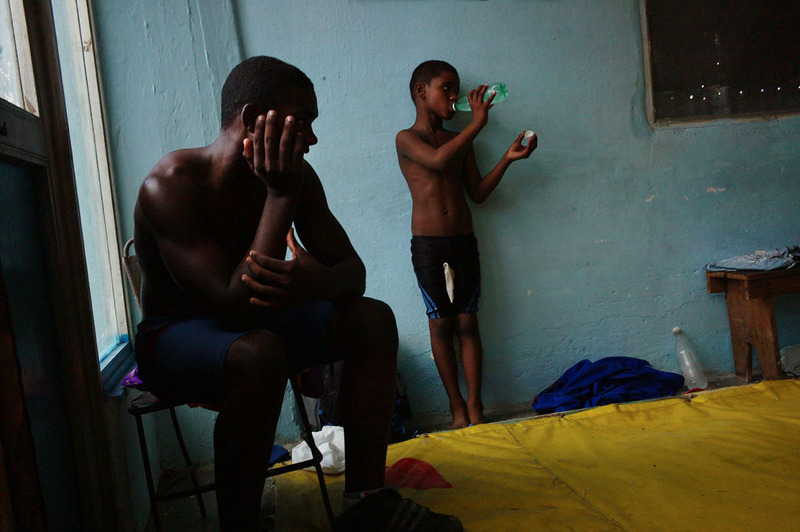 Father and son take a break from a football game. Sport stadium in Regla. November, 2013. 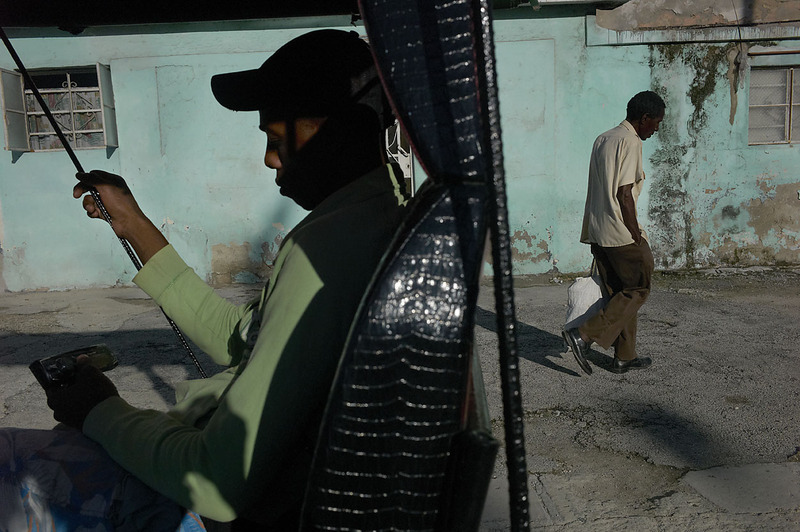 Bikes with a double seat serve as taxis in Havana. Driver takes a nap while waiting for a client. Habana Vieja, November, 2013. 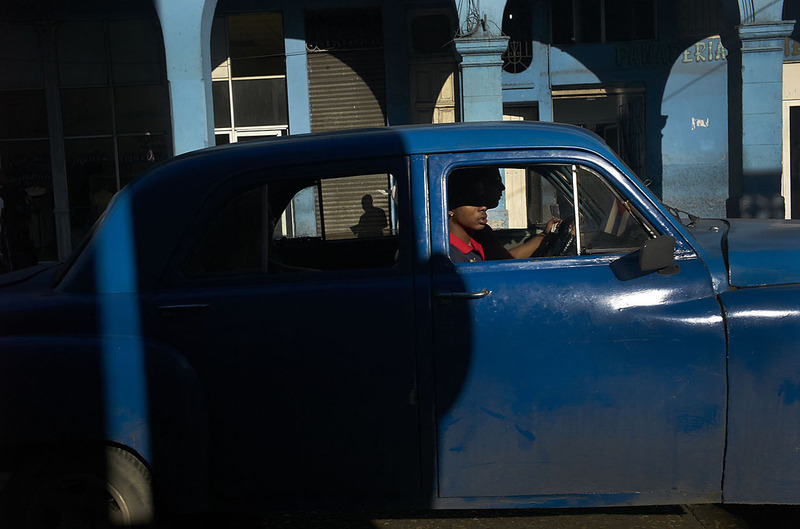 Because of the embargo, cars are not imported in Cuba. 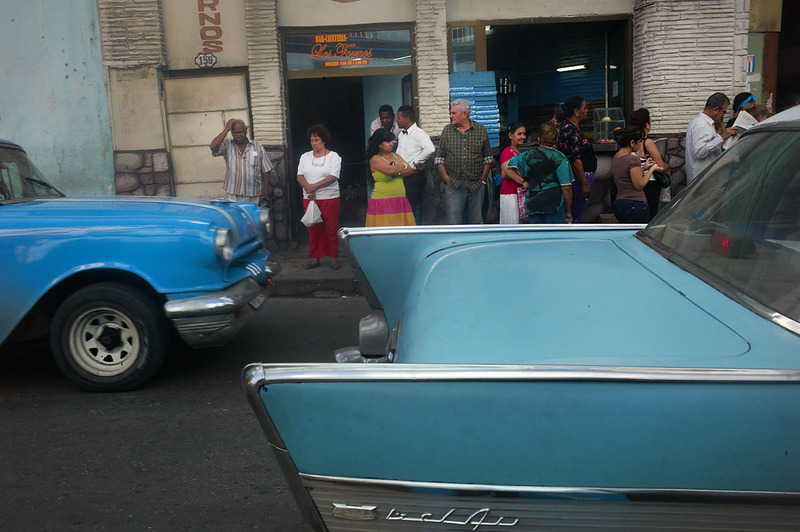 The majority of the cars are from the fifties. Cars are repaint and repair constantly. 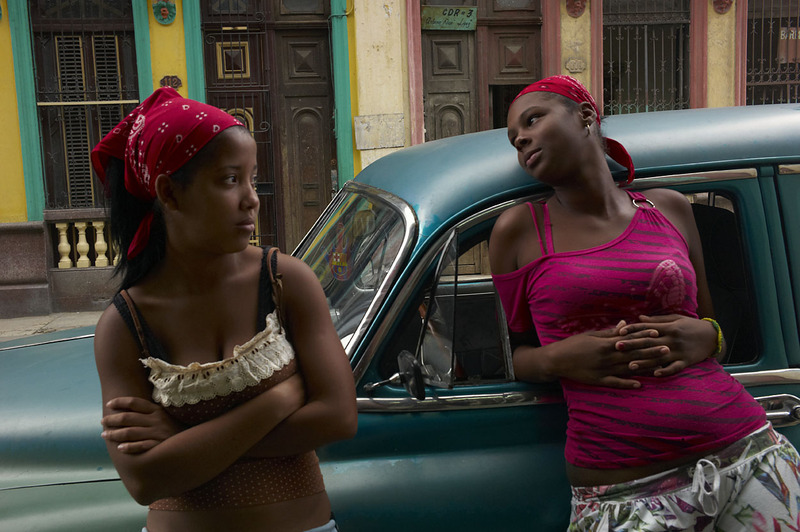 They are the charm of Havana. November, 2013. 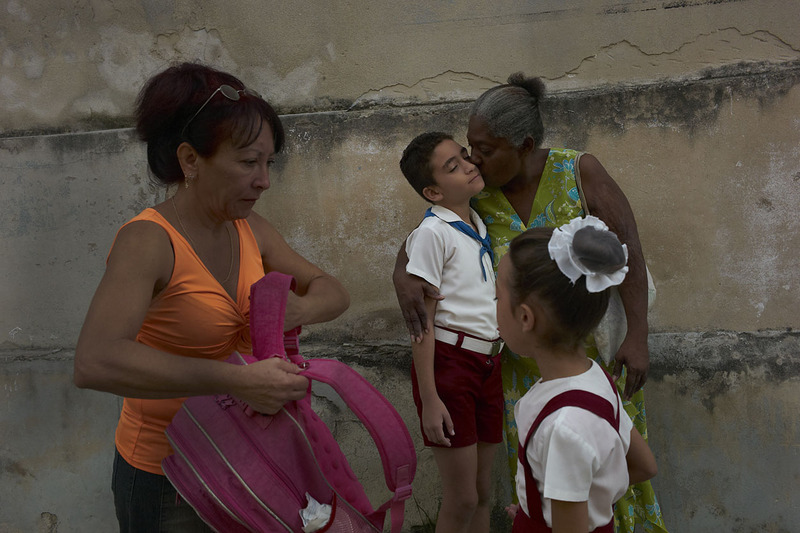 A kiss before school: a mother says good bye to her boy just before entering school. 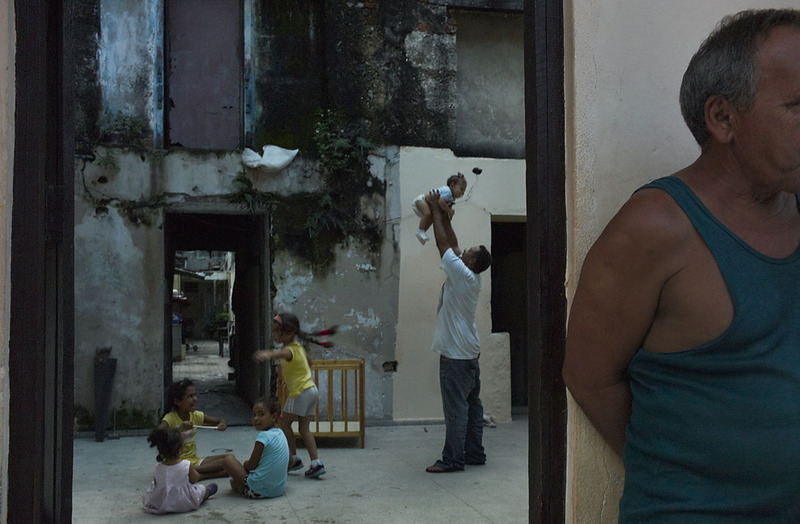 Mothers in Cuba look to care for their children a lot. Regla, November, 2013. Sisters waiting for their pizzas to be ready outside a small family restaurant. 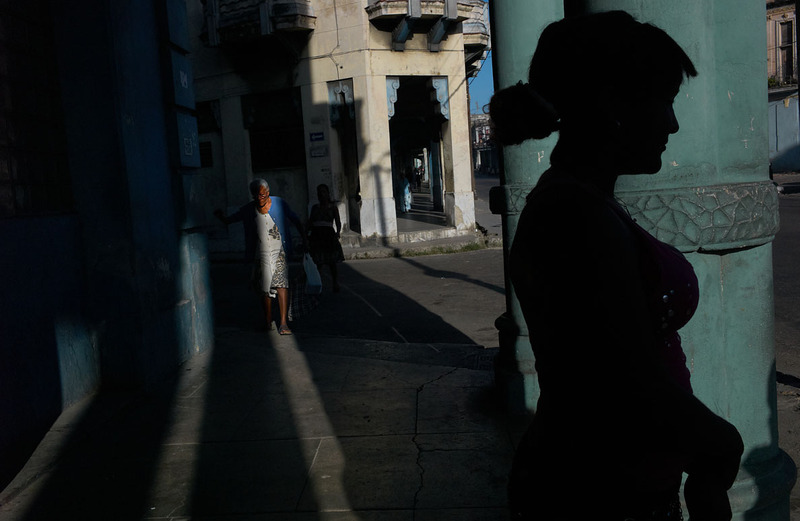 Centro Habana, November, 2013. Outside the house watching people pass. Regla, November, 2013. Mother talks to her child in the morning on the way to school. Habana Vieja, November, 2013. 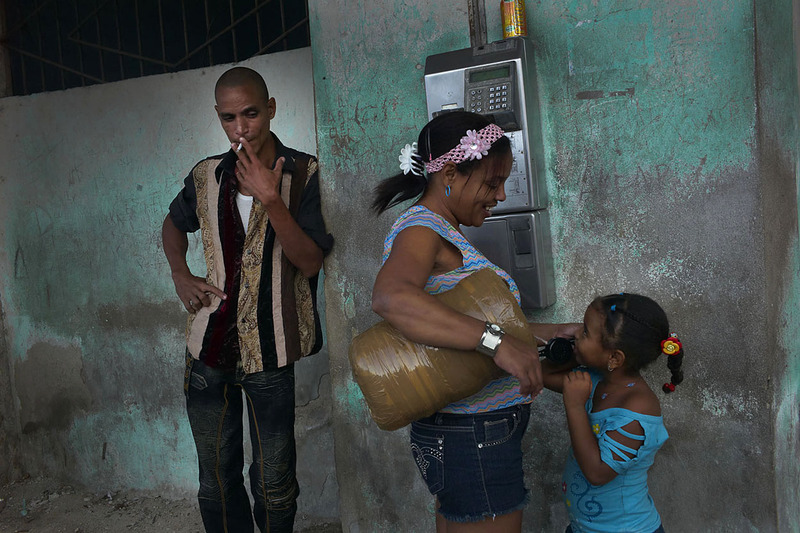 Cubans are use to queue to buy their food, to get into a bus, to use a public phone but do not seem to mind. Centro Habana, November, 2013. Ferry from Habana Vieja to Regla. Every 20 minutes there is a ferry taking passengers to Regla, the trip takes only 5 minutes. November, 2013. 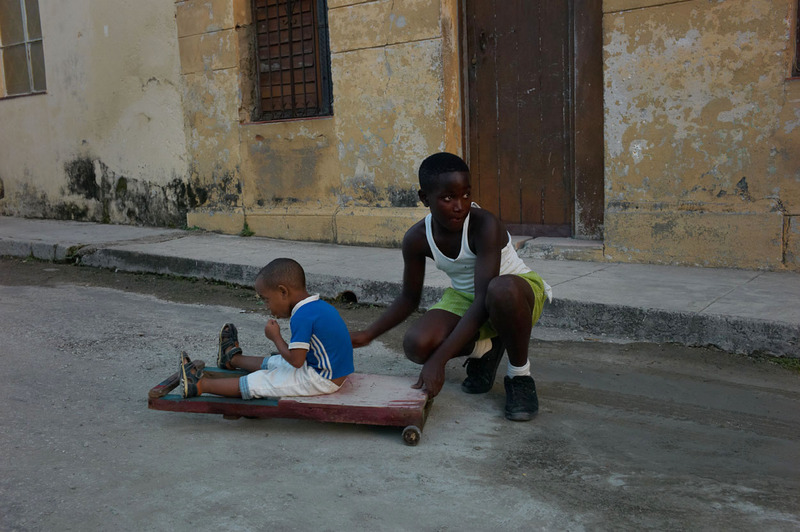 Kids playing outside their home after school. Regla, November, 2013. 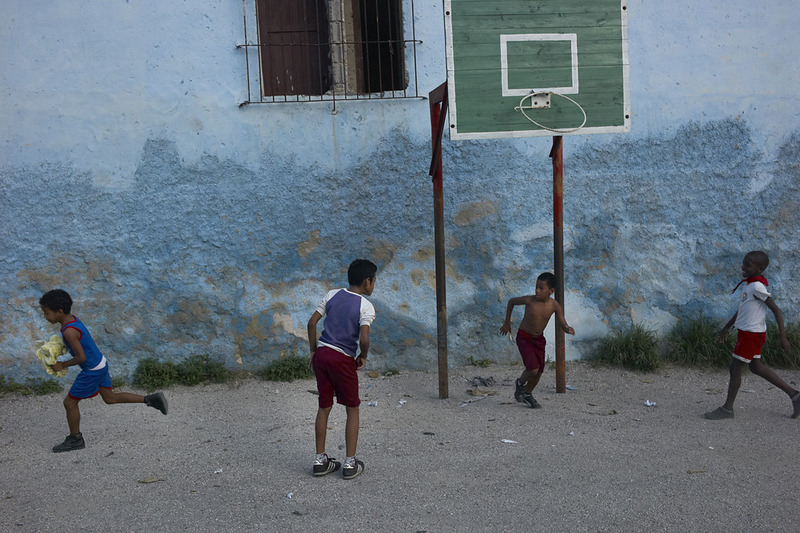 Boys playing soccer/football on the street after school. 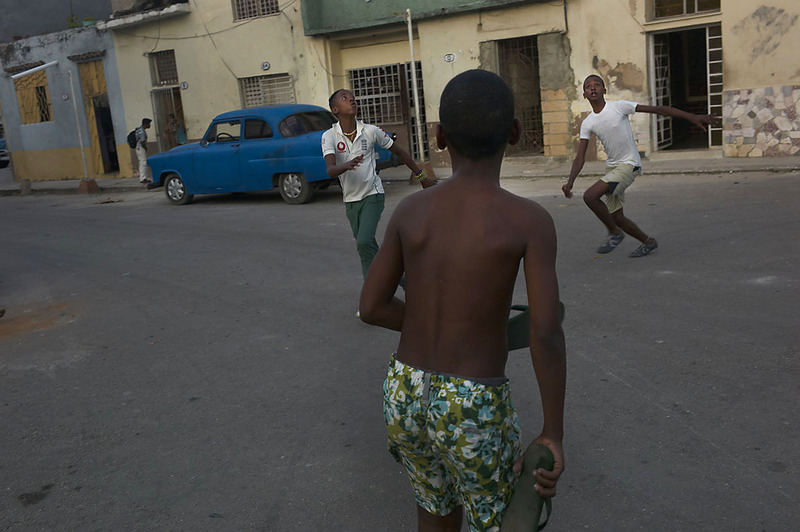 In every street in Havana one can find kids playing ball. 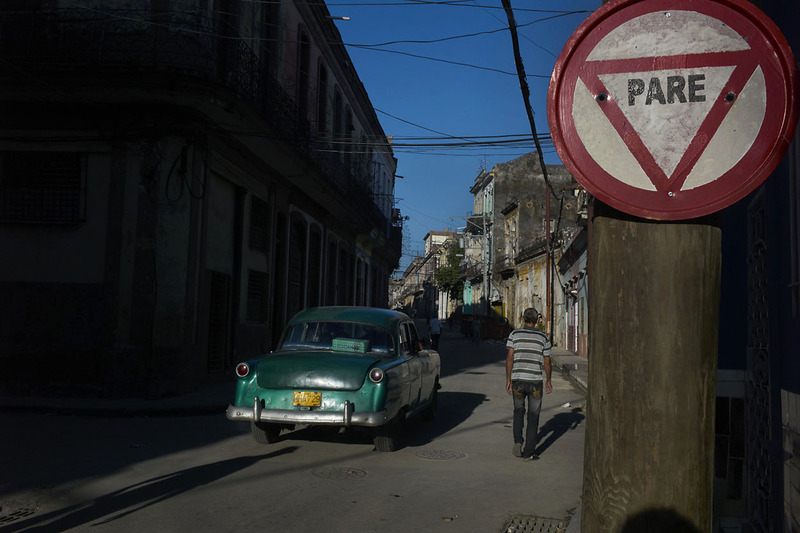 Habana Vieja, barrio San Judas Tadeo. November, 2013. Ladies outside their house under the hot noon sun. 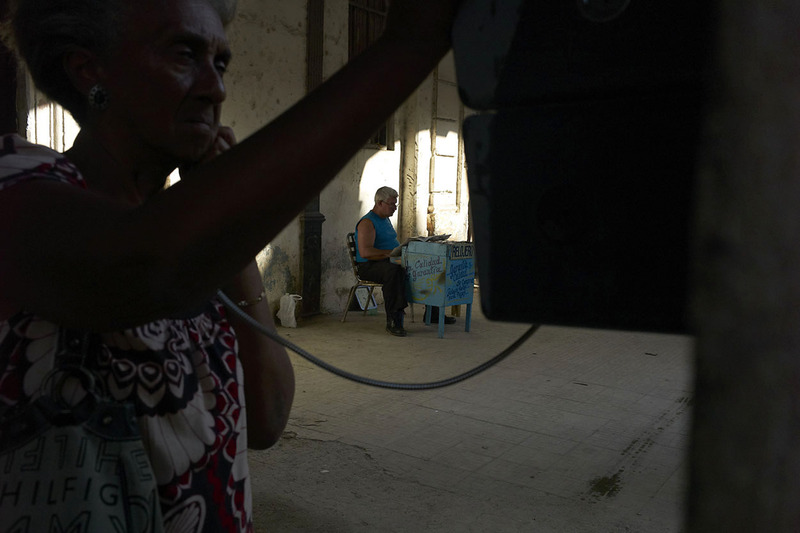 Electrical cables are apparent everywhere in Habana. Habana Vieja, November, 2013. Entrance hall in a day care center in Habana Vieja. 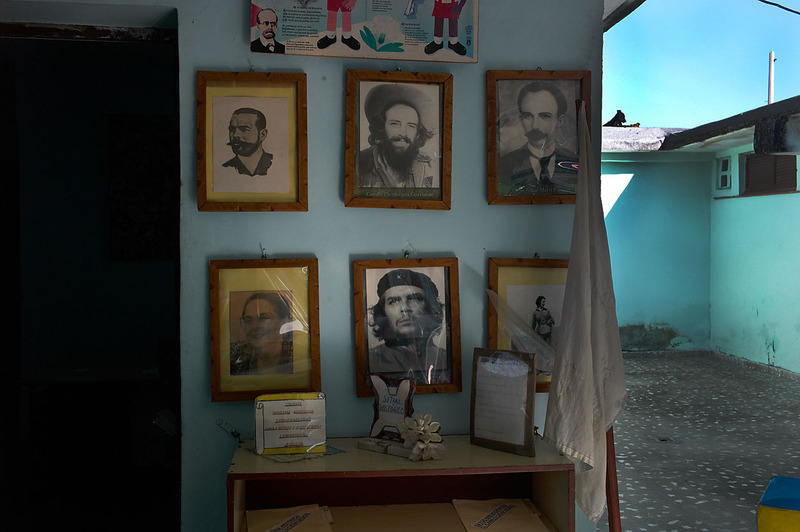 National heroes are on display, amongst them “el Che Guebara” and Camilo Cienfuegos. El “Che” is loved by all. November, 2013. Mother and children are extremely affectionate to each other and do not mind to show it. Habana Vieja, November 2013. 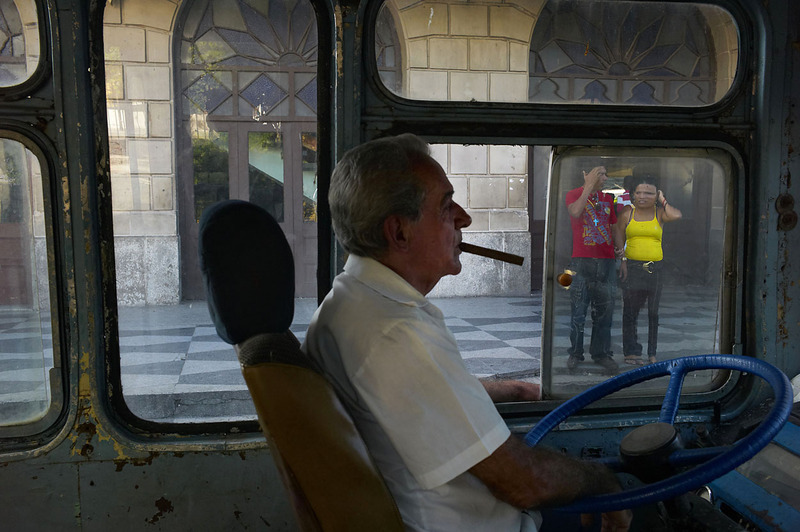 Taxi in Habana. Taxis are shared and normally are inexpensive. The lady is asking to the driver which way he goes. November, 2013. 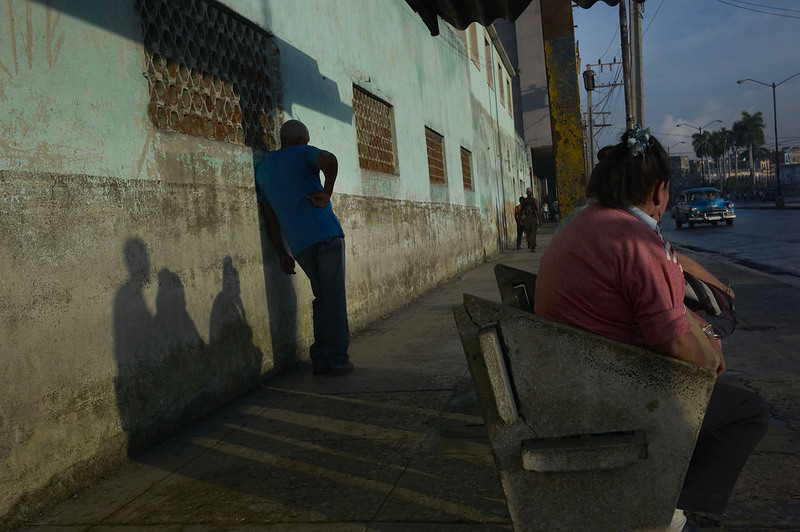 A young couple talking with their neighbor in Regla. 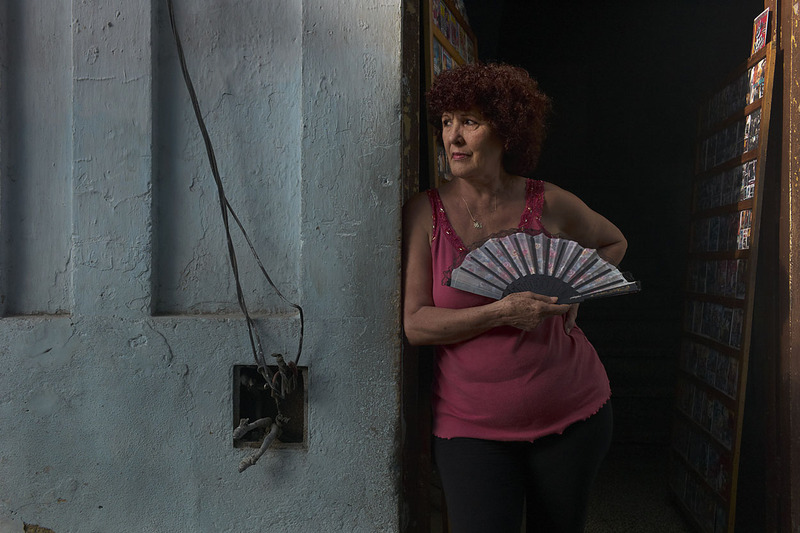 Regla is five minutes away from Habana Vieja by ferry. November, 2013. A Small family restaurant in Habana Vieja. 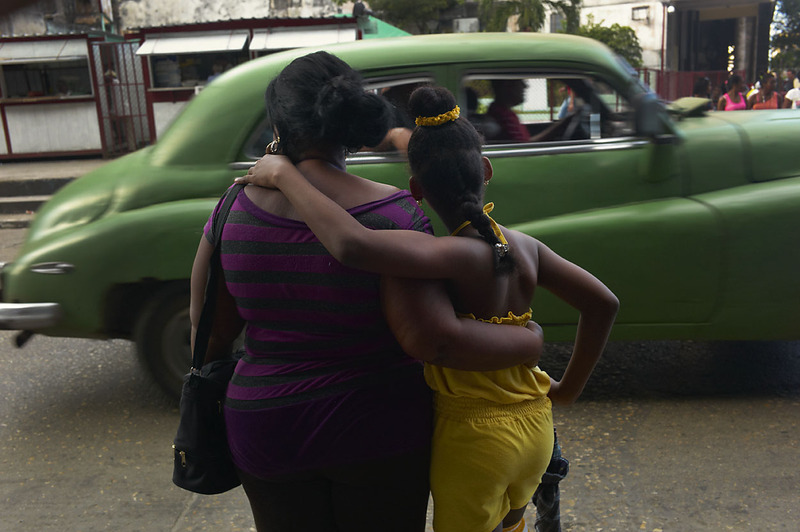 With the increase in tourist visiting Cuba, more and more family restaurants appear in Habana. November, 2013. Girl sits at home after school. Without internet, TVs or computers, teens have lots of free time and share the same space with the rest of the family. 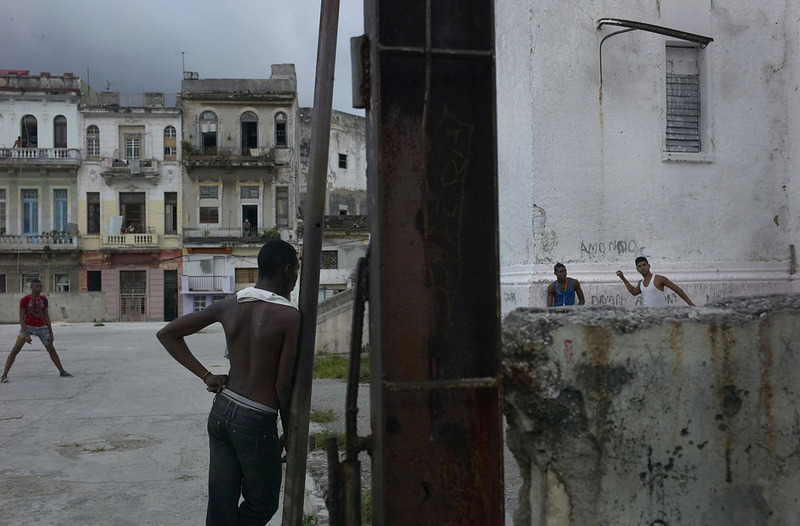 Habana Vieja, barrio San Judas Tadeo. November, 2013. School boy going home after school and a boy playing baseball in the street with a broom stick. 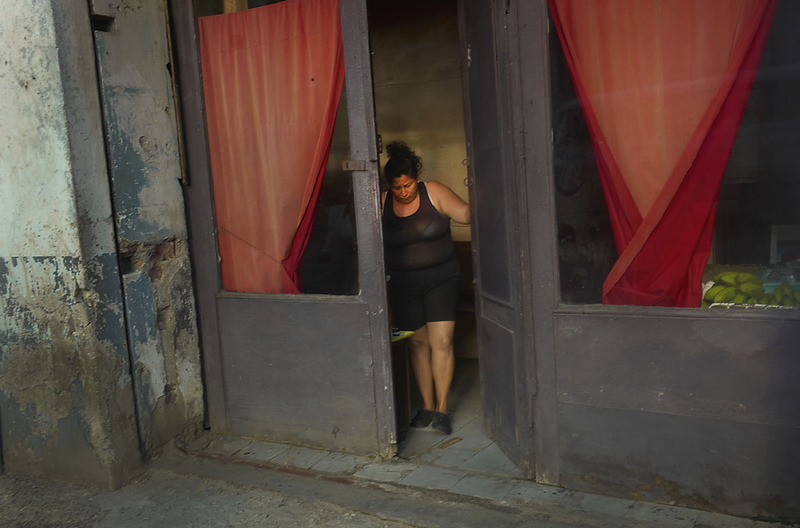 Regla, Havana, November, 2013. 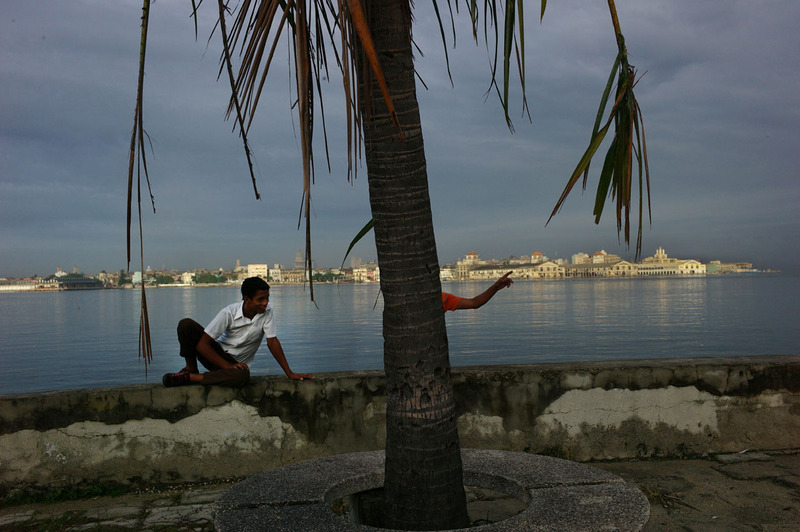 Regla is a suburb of Havana accessible by ferry just 5 minutes away from Habana Vieja. 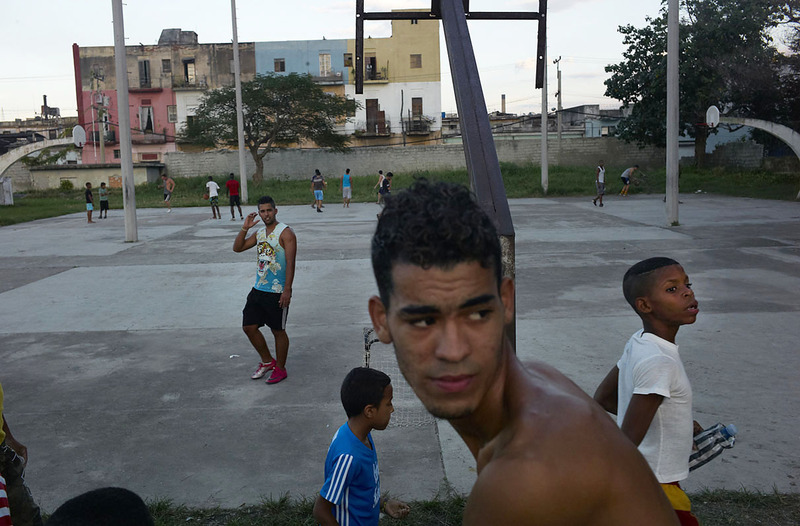 Young men playing soccer at the Ponton in Centro Habana. 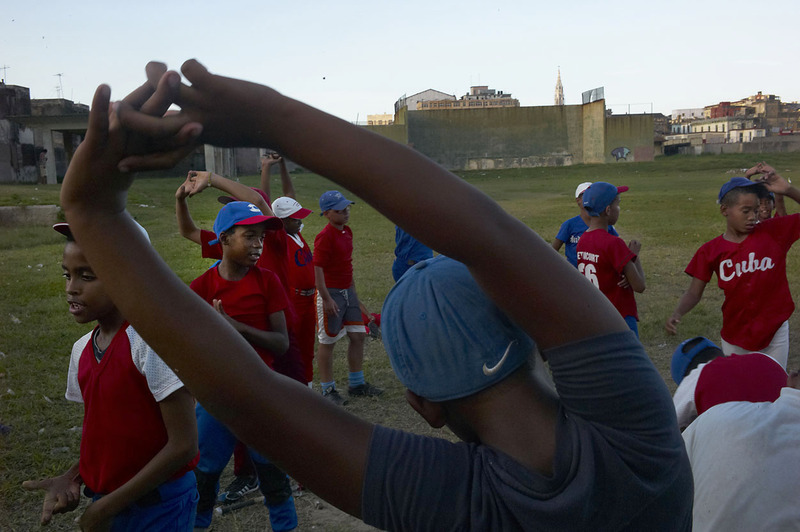 Ponton is a public sport complex in Havana where kids and adults come to exercise and play ball games. Usually kids come after school. November, 2013. Two girls going home after their dance class. 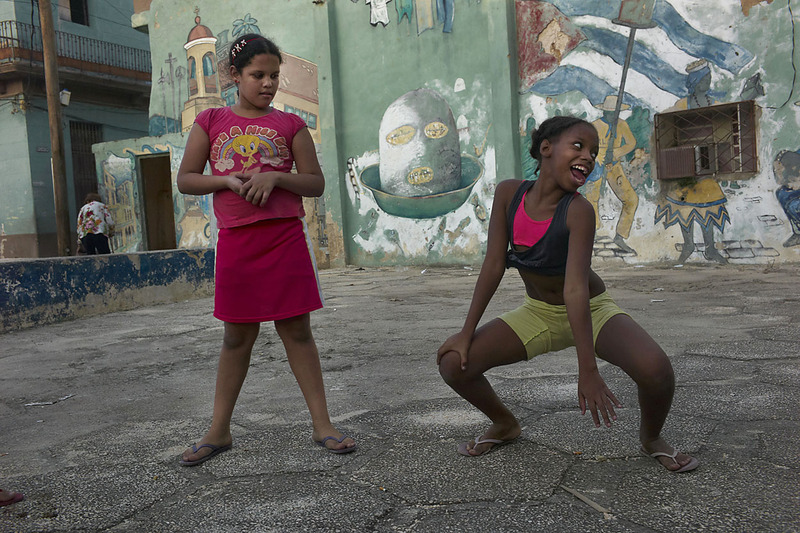 Dance is extremely popular in Cuba. Boys play baseball and girls dance. Habana Viera, calle Gloria, November, 2013. Man looking at a passing girl. Habana Vieja, November, 2013. Next to the ferry station in Regla. November, 2013. 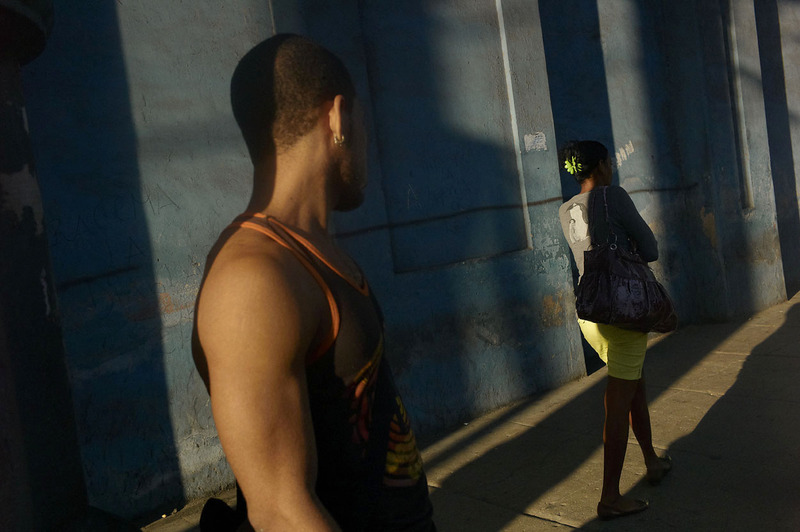 Street scene in Centro Habana, November 2013. Teenagers playing baseball outside their high school. 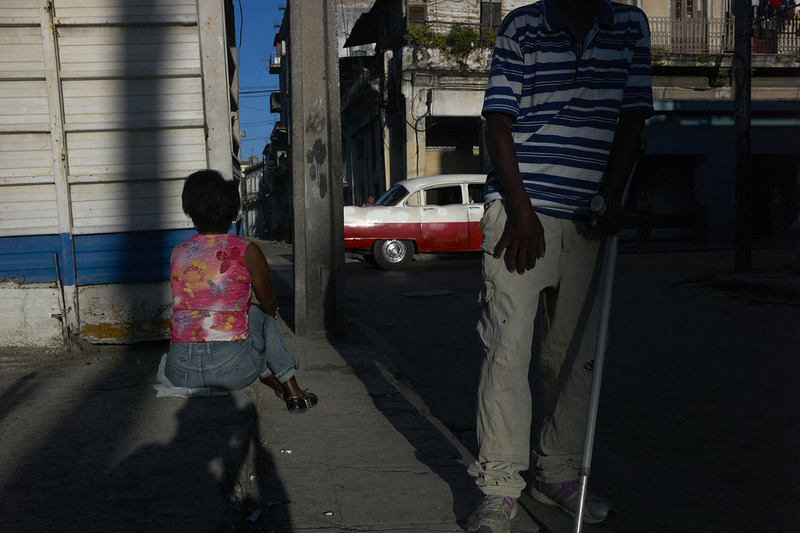 Centro Habana, November 2013. 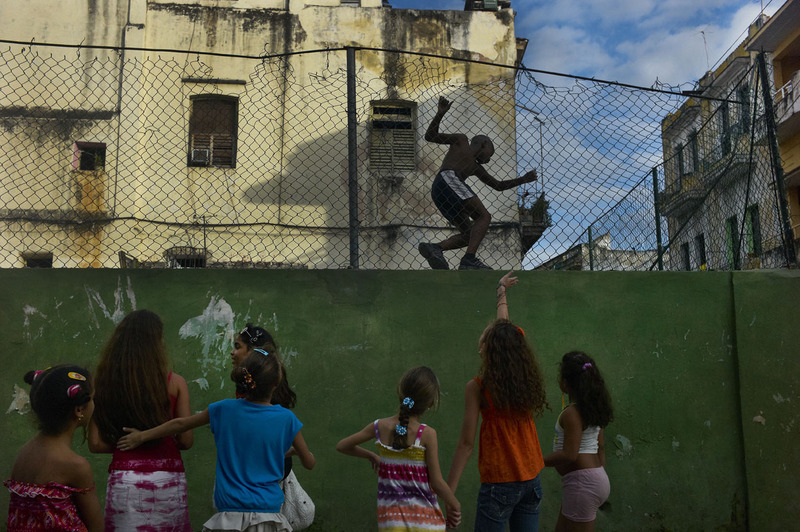 Girls playing and boy playing football the otherside of the wall. Boy is teasing the girls. Near Vedado an upscale neighborhood in Havana, November 2013. 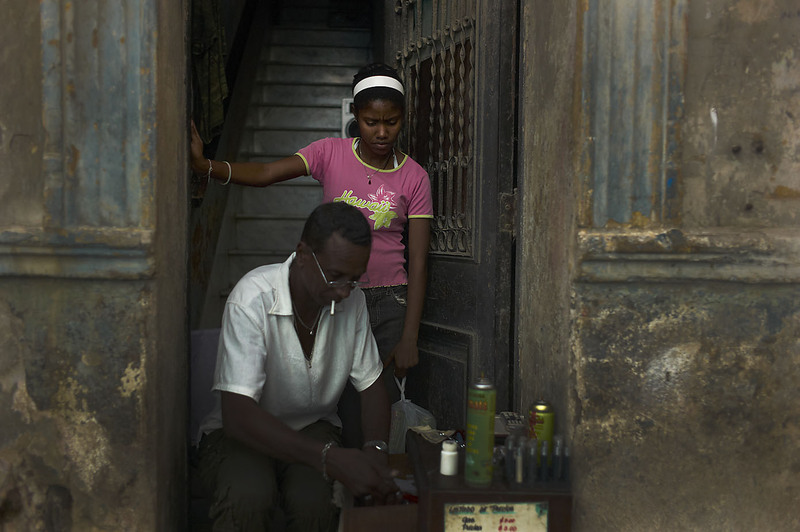 Man selling and fixing lighters out of his home. 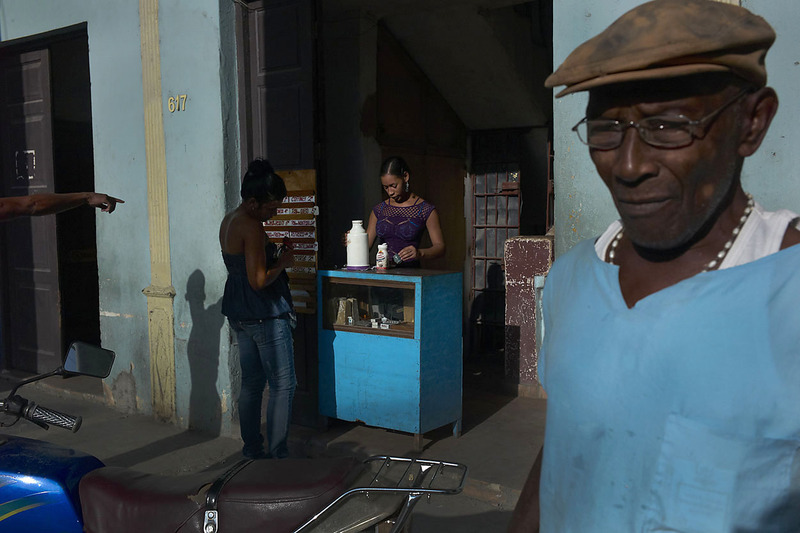 Many Cubans find small ways of making extra cash. Habana Vieja, November, 2013. 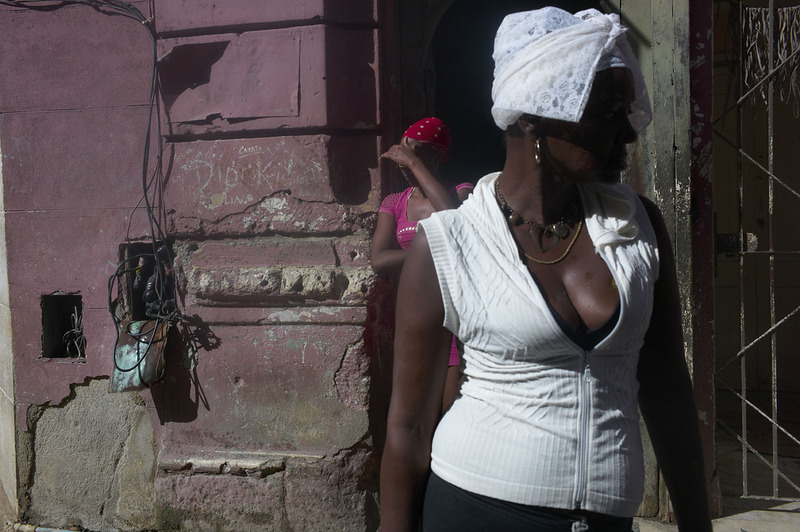 Woman crossing a busy street of downtown Havana. 1950 or 2013? November, 2013.